Brian Hunt, Moonlight Brewing founder and brewmaster and Shannon Thomas, tasting room and social media manager, are in today with Herlinda Heras and Steve Jaxon. Mark Carpenter is away this week. Brian Hunt started Moonlight Brewing in 1992. He jokes that he needed to support his beer habit and he actually stared home brewing in his bedroom when he was in high school. He had some German friends who helped him too. He graduated from UC Davis brew school in 1980, where Michael Lewis was his brewing instructor. There were 43 brewing companies in the United States then. There are more than that number now in just Sonoma County. He worked for a while at Schlitz in Milwaukee. The guy who had bought Schlitz said, “It don’t matter what I put in the can as long as it has Schlitz on the label.” He was only interested in money and he was fired. Then they hired a brew master and they decided to make good beer again. But the brand was in decline and when they closed Milwaukee Stroh’s bought them. Then Pabst bought them. 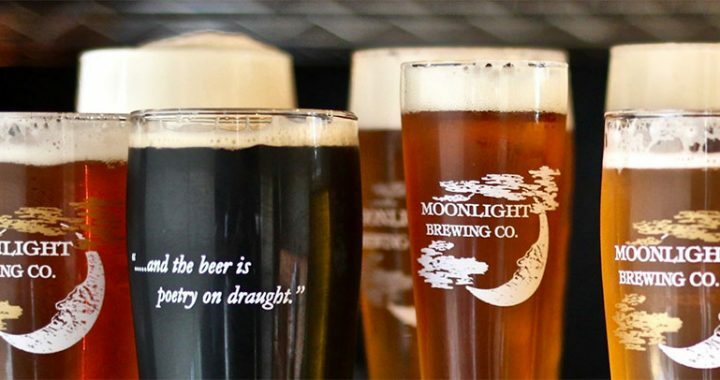 Moonlight Brewing will celebrate their 26th anniversary at an event in September. They are the closest brewery to Coffey Park in Santa Rosa, which burned in the October 2017 fires. They have a new taproom that holds almost 50 people. They built a bar out of reclaimed redwood, furniture from Bergamot Alley and old school chairs, making a very comfortable place. Moonlight Brewing is known for a beer they produce called Death and Taxes. They are snacking on some popcorn called Hippie Dust, which has Nutritional Yeast on it, which is tasty and very nutritious. Herlinda Heras tells about how spent grain from brewing is being used by bakers, such as one in Forestville, and that bread is available on Saturdays. They have a taproom open Thursday and Friday at 4 and Saturday and Sunday at 1. It’s the third location that they have had. They also make Bloody Mary popcorn and Maple Syrup popcorn. 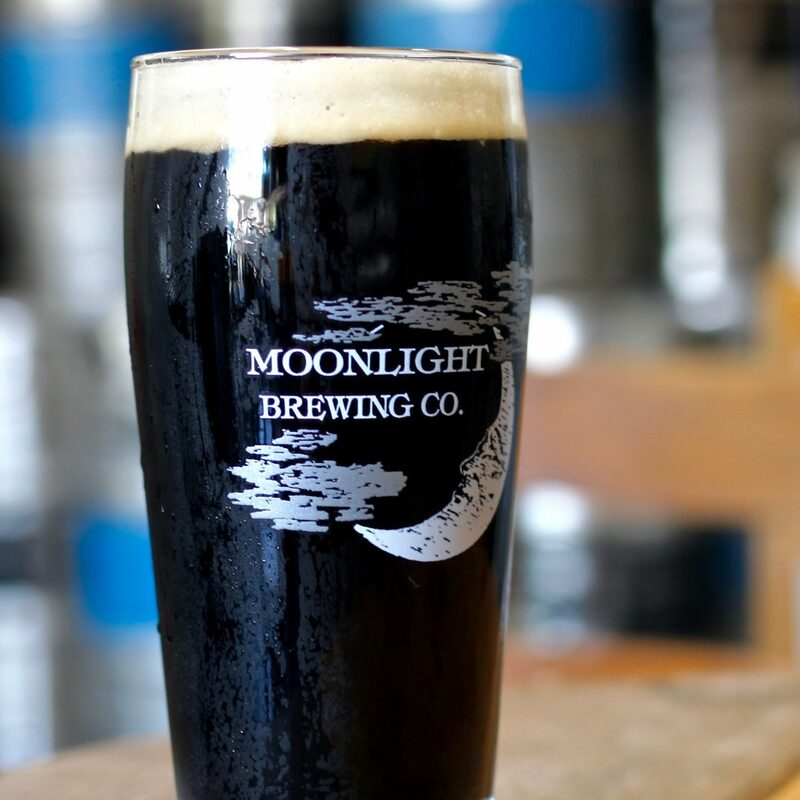 Their beer called Death and Taxes is one of the first beers he made at Moonlight. It’s a San Francisco style black lager. He has found that in Europe, people are used to there being local versions of beer named for cities or regions, while here, people act surprised at the idea. Shannon says everyone remembers where they were when they first taste Death and Taxes. Brian says that because it’s clean and crisp, it’s great for California. Brian describes the Lagunitas Beer Circus in London from his point of view. He gets to serve beer to people who like beer, but there are trapeze artists, burlesque, bikes, and a crazy goofy atmosphere. “See things you can’t unsee” is their slogan. As for his hop philosophy, he also likes to make beer without hops. He says it’s just a spice, but that you can put other things in it to flavor it. He just really loves a drinkable beer.